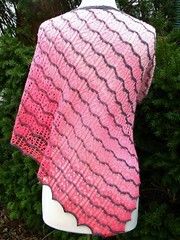 Of all the patterns I’ve released to date, the most popular by far is the Kudzu Shawlette. As of this writing, it has 207 finished projects in Ravelry — a order of magnitude more than any of my other patterns. I wish I knew what helped it make such a splash — surely being published in CEY’s web-letter helped a lot, as did being chosen for several lace KAL’s. I really have enjoyed seeing the variations people have made, such as this beaded Kudzu and this extra-deep Kudzu. Recently two designers asked my blessing for their patterns, which were inspired by Kudzu but definitely and distinctly their own design. 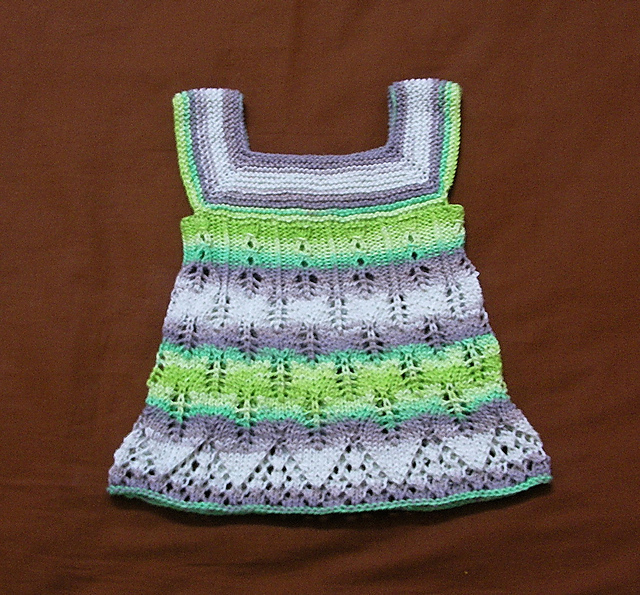 Adeline Too designed a girl’s summer top with Kudzu leaves as the body. I think her Kudzu Top is charming! Of course not everyone has an adorable little girl to knit for, but as long as you have hands, you can make yourself some Kudzu-inspired mittens. Rahymah Bintmichael used the ribbing and leaf motif for her Mittens with Leaves. I think they are very pretty!